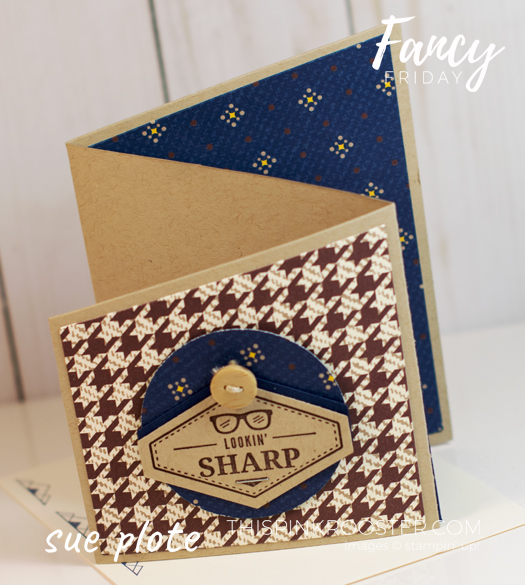 Welcome…to the Fancy Friday Blog Hop…a super fun hop where I’m lucky to get to work with my Fancy friends…who also happen to be past or current Stampin’ Up! Artisans! 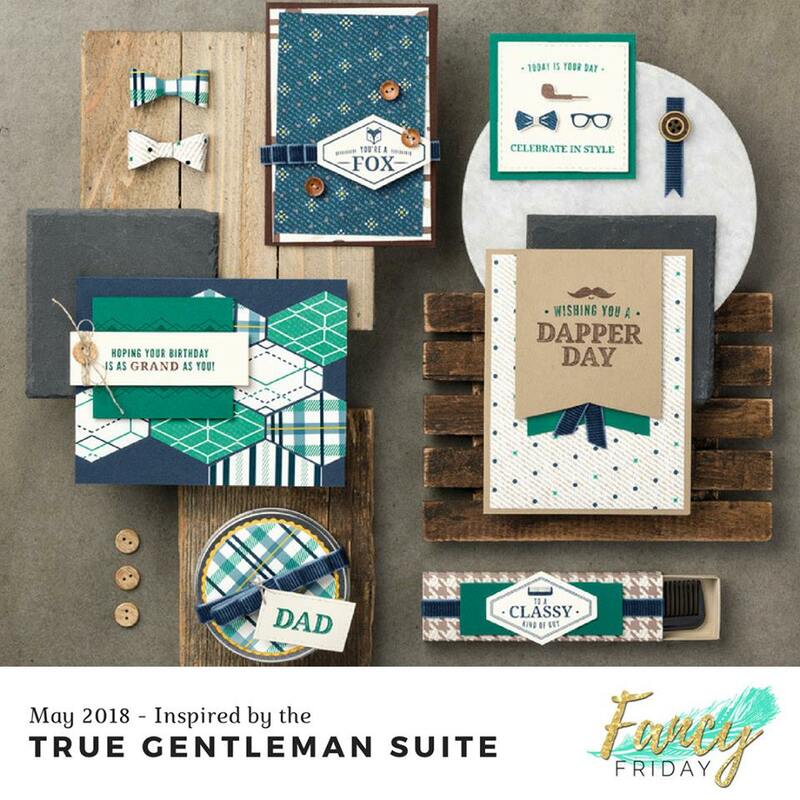 On the last Friday of each month we hop with a new challenge…and this month’s challenge is inspired by the True Gentleman Suite in the current Occasions Catalog. Just look! I so LOVE this suite…because there’s just so much masculine inspiration here! It seems like we’re always looking for crafting inspiration for our favorite fellas…and in my opinion projects for guys of all ages can be super simple…and to the point. Stampin’ Up! product suites make all of this so fun and easy. And that’s what I’ve done here…guy cards…simple and to the point…and easy and fun using the True Gentleman Suite. First up…let’s check out this versatile Z-Fold! Z-Fold cards are so awesome…for so many reasons! If you need something simple or fancy…patterned or plain…masculine or feminine…floral or geometric…the Z-Fold has you covered! Here…I folded my card base…and added coordinated DSP to the front and last folds. I stamped my image in Chocolate Chip ink on Crumb Cake cardstock…punched it out using the Tailored Tag punch…punched a tag in Night of Navy cardstock…and used the 2-1/4″ Circle Punch for my DSP circle. I layered it all to create my focal point…and added True Gentleman Button filled with Linen Thread. For the center fold…I created and added a Night of Navy pocket…for a gift card or a sweet note. So easy! And perfect for any guy! And then…this simple folded cared was just as simple. Here…I again folded my card base…and added coordinated DSP. I punched a bit of Night of Navy cardstock using the Tailored Tag Punch…and then grabbed the Bow Builder Punch to create the DSP bow tie. I added a True Gentleman Button…and attached it all as the card’s closure. I added a bit of Very Vanilla cardstock to the inside…and it’s ready for any sentiment I might want to add. 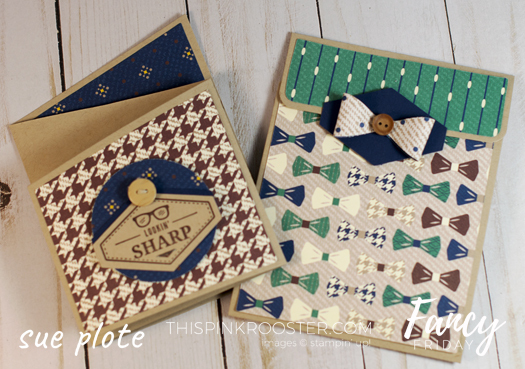 Here they are together…gentlemanly inspiraiton! I have to say that seriously…these cards almost put themselves together. And yes…that’s that’s the magic of Stampin’ Up! product suites! Look for 14…YES, 14…new, coordinated suites in the 2018-2019 Annual Catalog. They’re listed on page 2…and I just know you’ll be amazed! Oh…and if you need a catalog let me know! Note: Sadly…the True Gentleman Designer Series Paper is no longer available…but these projects can be easily created with any other coordinated DSP. Seriously…the sky’s the limit! Also…the Truly Tailored Stamp Set is guaranteed available until May 25…and after that it will be available while supplies last until May 31. Happily…the Tailored Tag Punch and the True Gentleman Buttons will be available in the 2018-2019 Catalog. Yay! 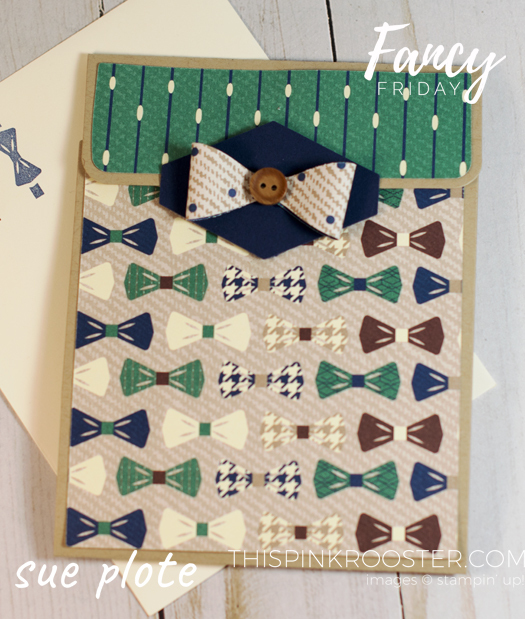 Thank you so much for stopping by for the Fancy Friday Blog Hop! I hope you’ll be inspired the True Gentleman Suite to create something fabulous…and I’d LOVE to see it! So…post it, using #fancyfridaybloghop when you share it…and let me or one of my Fancy friends know! And now…click below to hop over to see what my talented, Fancy friend Holly has for you!